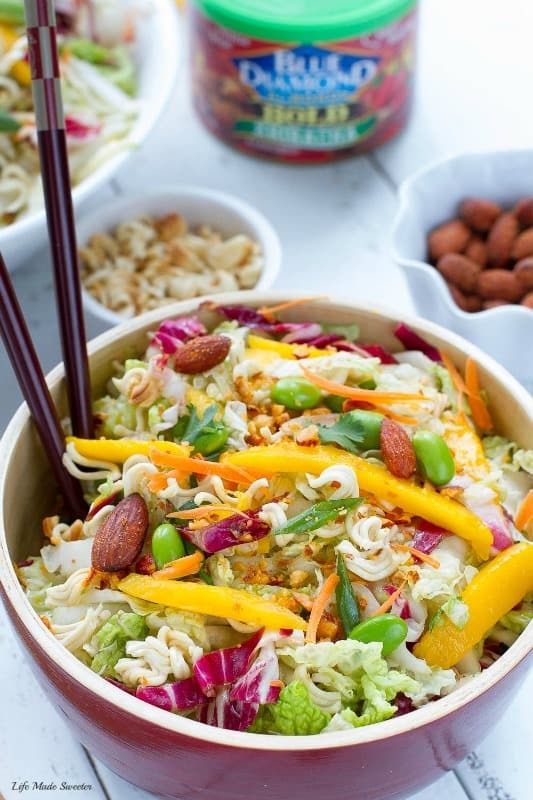 A sweet, spicy and tangy Asian-styled salad with crunchy Ramen noodles and Sriracha flavored almonds. So easy to make and perfect for potlucks. 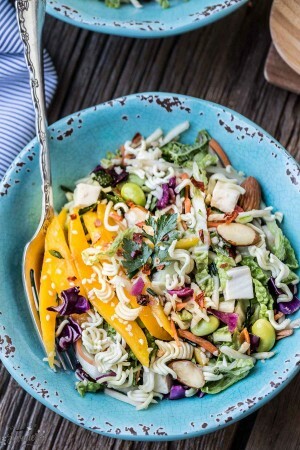 After two ice cream bar recipes in a row, I figured it was about time to share something a little bit healthier — like this salad I mentioned I had originally planned to post on Monday. 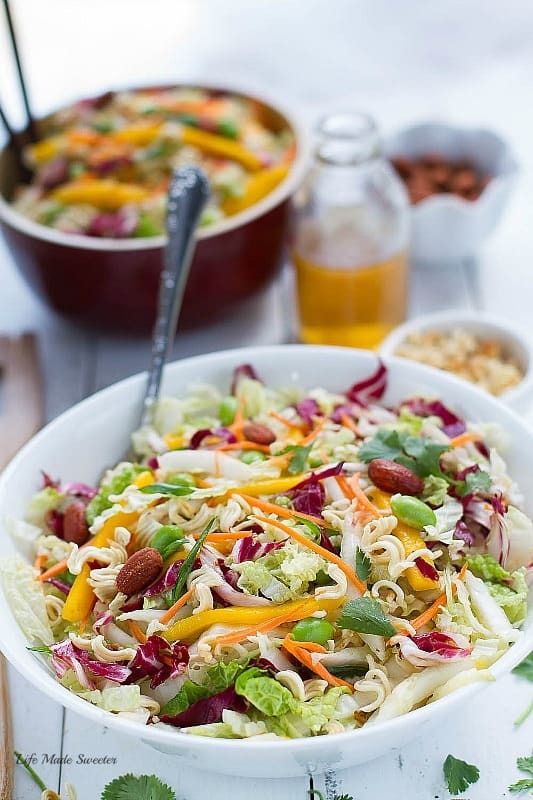 This Crunchy Asian Ramen Noodle Salad makes a regular appearance at our house. I shared a similar version on the blog last year and figured it was time for another remake. It’s one of my husband’s favorite dishes that he requests frequently. This says a lot since my husband is NOT a big salad eater. He’ll even offer to help me toss the salad when it’s time to add the dressing. My mom used to make her own version with chicken for us almost every week and anytime there was a family function or get-together. It was always one of the first dishes to go and never any leftovers whenever she brought this to a potluck or party. I was one of the pickiest eaters growing up but I remember actually getting excited whenever my mom made this salad. It would have slightly different mix-ins every time depending on what she had on hand. 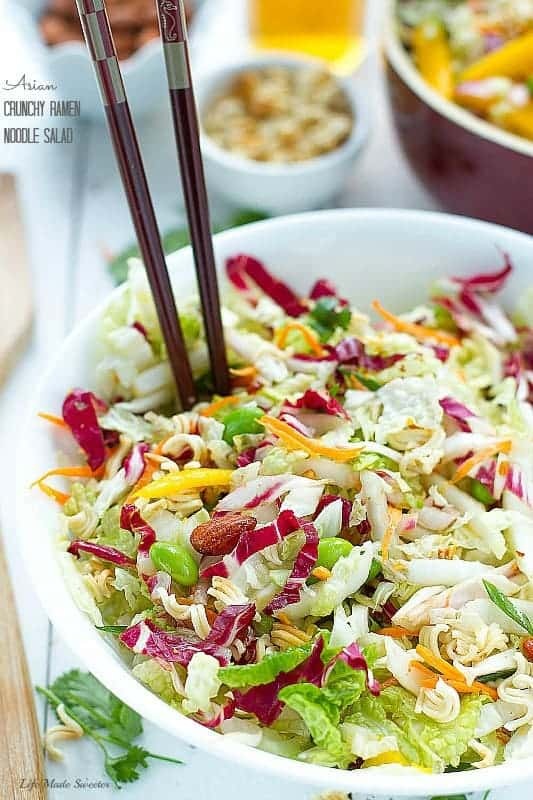 I usually include shredded Napa and red cabbage, sliced green onions and shredded carrots. 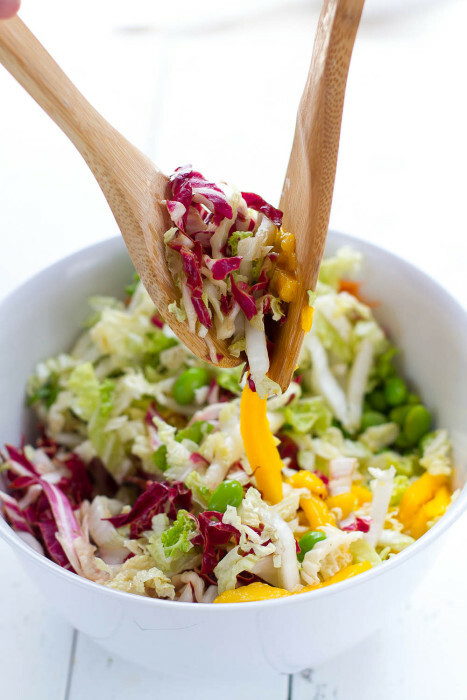 You can use regular green cabbage if you like or to make things easier, a package of your favorite coleslaw mix. For today’s version, I left out the chicken and added some shelled edamame, a sliced mango, fresh cilantro and for some added crunch and spice — toasted ramen noodles and crushed as well as well as some whole Blue Diamond Sriracha flavor almonds. Blue Diamond Almonds make a variety of almond flavors and the sriracha flavor is one of their newest flavors. These almonds are perfect for snacking, especially if you’re a fan of sriracha and all things spicy like I am. 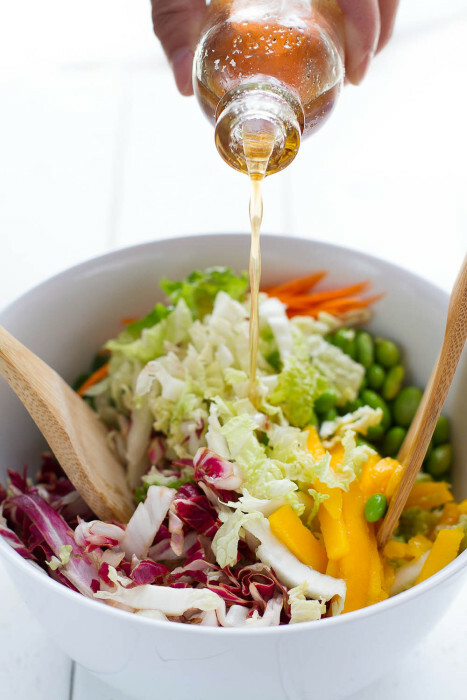 The best part about this salad is the super simple dressing that’s easy to put together. It’s made with rice wine vinegar, honey, sesame oil, minced garlic, ginger some salt and pepper to taste and any type of neutral oil. My mom used to add a touch of fish sauce for that umami kick but I decided to leave that out today since we have the sriracha almonds and threw in a pinch of crushed red chili flakes instead. 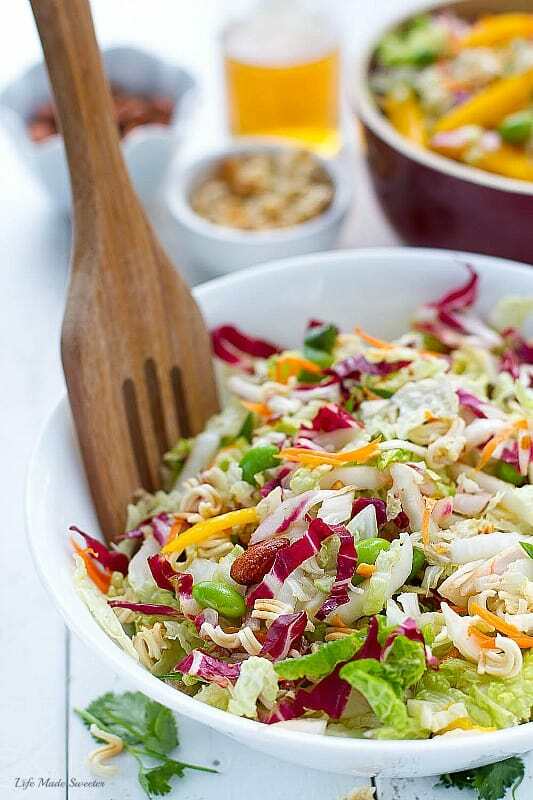 This amazingly simple salad is crunchy, tangy, sweet, with a little spice and is sure to be a hit at your next summer potluck or cookout. Place ramen noodles and half of the almonds in a large sized zippered plastic storage bag. Seal the bag and crush using a rolling pin. 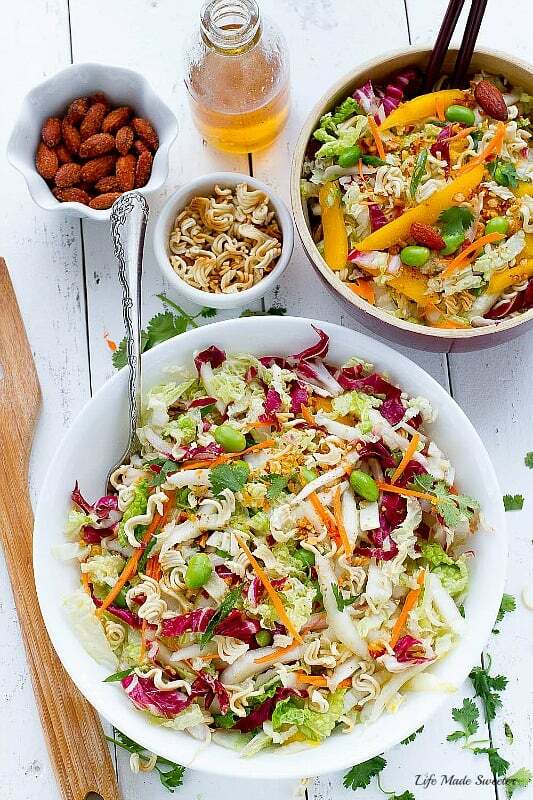 In a large bowl, combine the two cabbages, edamame, mango and carrot. In a small mixing bowl, whisk together the ingredients for the dressing. Taste and adjust seasoning to your liking. Pour desired amount of dressing over salad and toss to combine. Place in the fridge for about 10-20 minutes for flavors to meld. Right before serving, fold in ramen noodles, green onions, cilantro and crushed and whole almonds. Best enjoyed immediately or on the same day. 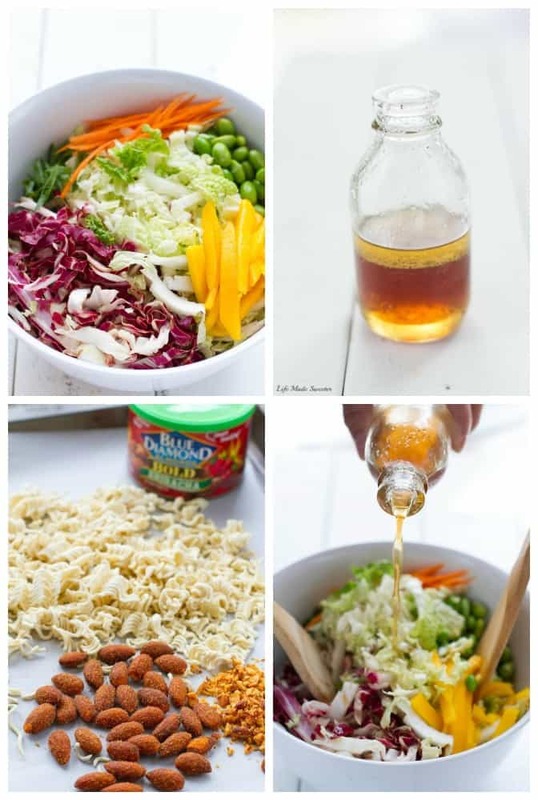 **To make this ahead of time, do not add dressing or ramen noodles until right before serving. Disclosure: This post was sponsored by Blue Diamond Almonds. As always, all opinions and recipe are 100% my own.